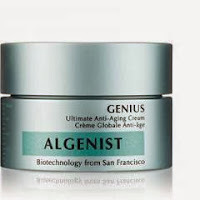 Genius Ultimate Anti-aging Cream combines for the first time Algenist’s patented Alguronic Acid with a new source of nourishing oil, Microalgae Oil, and a plant-based collagen. Alguronic Acid is Algenist’s special anti-ageing formula sourced from Microalgae and features across its entire skincare range. Algenist claims the new combined formula helps to visibly restore skin resiliency and elasticity to deliver a firmer, tighter and more toned appearance. In a consumer study Algenist says 95% of 100 women using the cream twice daily said dull skin was brighter in 10 days and 91% said fragile skin texture appears re-inforced within 10 days. I really like Algenist, particularly the face serum. Space NK sells the range in the UK. I don't know where you live but if you have a store close by you could always pop in and sample.